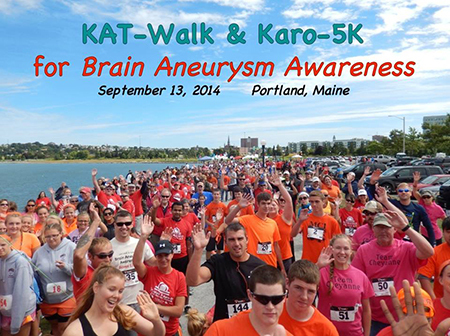 On Saturday, September 13, 2014, the KAT-Walk & Karo-5K for Brain Aneurysm Awareness was held at Portland, Maine. September is Brain Aneurysm Awareness month and this annual event is held to honor survivors and remember loved ones lost to this silent killer. Over 600 people enjoyed the day to “Share their tears, Remember with love, and Walk & Run to honor”. 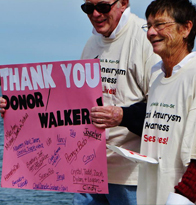 Families from Maine, New Hampshire, and as far away as Boston, Vermont, New York and Florida used this event to celebrate their survival or remember their loved ones lost to a brain aneurysm. 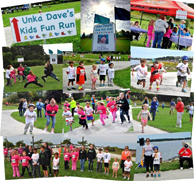 This year saw 21 BA survivors with their family and friends walk or run and the 1st annual “Unka Dave’s Kids Fun Run” was a wonderful addition to the day’s fun. 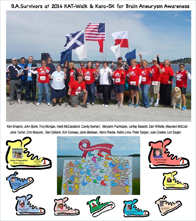 We were especially honored to have “Team Nolan 13” from the Pittsfield, Maine area join us with over 160 people walking and running in memory of Nolan Berthelette, a 14 year old boy lost to an Aneurysm in July, 2014. In excess of $30,000 was raised to benefit the Brain Aneurysm Foundation, and we are proud these funds will provide critical awareness, education, support and research funding, which will ultimately save lives. To all the many families that came and participated, either to celebrate their survival or to remember their lost ones – thank-you for joining us and for your continued support to make this a special day for the brain aneurysm community. Check out the video tribute below to all of our supporters and participants! THANK YOU!